February 18, 2009 - whoa, how the time flies! Well... should I count the little paper dolls I made in kindergarten? I always liked to try to make new things. Each time I see a handmade object I wonder, couldn't I do one too? I wish I had time to experiment with a lot of different media. I keep shopping for materials and have my house full of beads, leather, wool, clay, paper, you name it, I've got it! Bookbinding still remains one of my favorite things to do - because the process is so interesting and I smile thinking that people write their thoughts in it as I did in my diaries. My first costumers were friends and friends of friends and I love to see their journals - some became sketchbooks, some diaries, some art books or photo albums. It's like they have a personality of their own and that is why I am fond of each journal I make. I can't remember where I saw this site first but I felt in love with the beautiful items right away! There aren't many fairs where I live and I found in Etsy a non-stop fair where I can discover little treasures made by wonderful artisans. I used to make books before Etsy but just for fun. 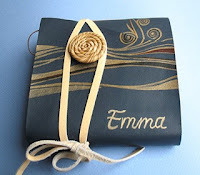 Since I opened my Etsy shop, bookbinding gained more importance in my life - now I just wish like everybody else to be a full time artisan and quit my day job. Before it was just a hobby, now it's also a business, but I still love it like in day 1. Yes, but not for long I hope. I am a web designer, I love what I do, but crafting beats that cause I can actually see a real object coming out of my hands, not a virtual one, and that makes me feel great. I love to make my environment, to personalize my home with handmade stuff made by me or other fellow artisans. Does anyone help you?Yes, everybody helps me! Specially bringing me little charms or a nice peace of leather they found in a shop, "look what I found for your books" - it's very nice of them and sometimes I feel it's a group work. Well... I'm a newbie myself, I try to learn tips and tricks as much as I can but it still feels like I am only scratching the surface. My advice is that they must not be disappointed if they don't have much sales - and remember that advertising is equally important to the quality and beauty of your products. It's like talent and work - you can only get somewhere with both of them. Every artisan should try blogging, twitter, facebook, flickr. - Oh, crafting is easy - selling is hard! The thing I like most in making my books is choosing the cover color and embellishments to match. What I find quite challenging is writing custom initials on the cover, as I offer this feature for some of my works. They must be perfect because the notebook is not mine anymore at that time so I can't blew it. But I've had no complains so far. There are very few fairs and I tried once to display my work at a Local Art Gallery but they were soon damaged - dirty pages and all - and I hate to see my notebooks like that since I put a lot of care into them. 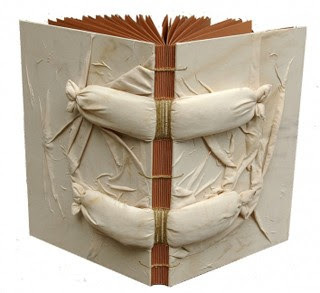 I saw different Art Books on the internet (http://www.guildofbookworkers.org/gallery/markingtime/artists/Alexander.html) and that made me look at journals from another perspective - as interactive art objects. I tried some Art Books myself but I could never sell those - they are to dear to me. I get attached to my Etsy journals as well and feel weird when I see them go. I like longstitch, and longstich likes me. It just seems such an easy bookbinding technique and looks nice on the spine. I also like coptic stitch and on my to-do list learning new stitching techniques is a priority. The ruler... I'm sorry, should've said something more fun, but it would have been unfair not to mention it just because it's just a plain object. It's really useful and I couldn't live without it (love you, Ruley)! I used to use fabric but now I'm all into leather. I just love its texture, its luxury appearance, its smell, its shine, its durability. Also, I love polymer clay, it is such a versatile medium and I can do anything I have in mind with it. Also, my newest hobby is making recycled paper with leaves and flowers - I gather all the nice fallen petals from my garden, then I dry them for future use. 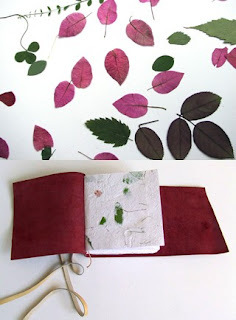 I already started to make journals using my handmade paper and plan to make more. I think they are romantic - plus, I get to recycle all the paper that would go to waste otherwise. My blank books don't really have a subject, but I tend to use nature elements - like flowers, leaves, trees... and usually enhance their geometric resemblance - the snail becomes a spiral, the buds little circles... Then it's all about playing with shapes and hues. Thanks everybody for reading my interview and feel free to get in touch with me - I love to interact with people that share my interests. You can follow me onhttp://twitter.com/baghy or stumbleupon http://baghy.stumbleupon.com/, where you can find a lot of quality contemporary art I find and like. I think Anca's work is beautiful! So nice to get to know her a little through this interview.